I hope luck's on your side today. I love these giveaways! Do you sell book lots like this? Another wonderful giveaway! Thanks for the chance! Just found your site through mental Floss. I love when I find old receipts or notes in books. LBabroski - I will occasionally put together a little bundle on bookperdiem, but for the most part I sell books one at a time. My husband loves Eliot. Thanks! I would love to enter for these books! They will go wonderfully with all my other antique books :) Thanks for offering this! Ooh, everyone loves Poe. Please count me in! I would love to win these beautiful books! Thanks for the opportunity. Love the look of these books. Please enter me. Thanks - hope your Friday 13th is great! I feel lucky so count me in! Thanks! 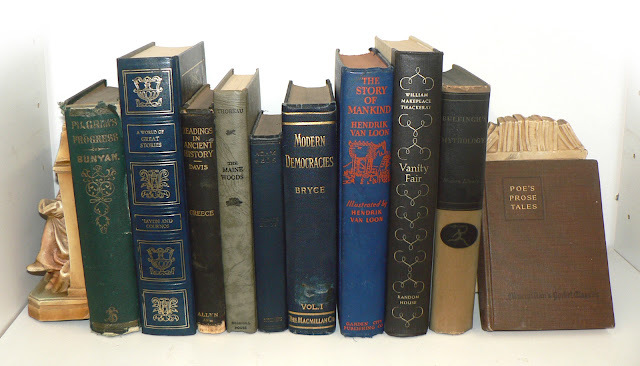 Pilgrim's Progress, Readings in Ancient History, Bulfinch's, Vanity Fair and Poe? I adore this collection! Poe? George Eliot? Count me in! These look great! Count me in! Beautiful books as usual. Please consider me entered. Ohh me me! I would love to win this giveaway! Your site is so wonderful. I work for a library and also post the random things I find but not at all to the degree that you are able to! Oh I love Poe ever so much! Fingers crossed! I would love to enter your book giveaway! Thanks - love your website... I have found many interesting bookmarks in books at my public library - have often wondered about doing an article or something about this topic. Fascinating! I'd be a fool not to enter the chance to win some Poe and Eliot. I am powerless in the presence of George Eliot. Well...her book presence. Oh, you know what I mean. Wonderful collection! Thanks for the giveaways! Would absolutely love a chance at these! They are gorgeous! I'm always good for free Books!! Crossing fingers. Love Vanity Fair and Edgar Allan Poe! What a great giveaway! Thanks for the chance to win. Raising hand! What a great selection. Heart skipped a beat at several of these! Love your site! Please enter me in your giveaway. I just found your blog today. I'm a librarian, so I'm just as interested in the books as the bookmarks. Fascinating!!! Oh my! Did I miss it? We're having a yard sale today. I started following you a couple of days ago...Love this site! Please enter me for the give-away! My SIL is totally a vintage Poe guy. Feeling lucky on Friday the 13th! Please enter me! What a gorgeous copy of Pilgrims Progress! Yay books! Poe is awesome! Another great bunch of books. Here's my hat in the ring. Amazing site. And beautiful books! That's a fascinating group - I can't decide which one I'm most excited about. Another cool selection. I'm in. Oh, I would love to win those! I would love to have these... Poe is one of my favorites!